Placing speakers can be a difficult task, not only do you need to balance visual aesthetics with optimal sound performance, but there are different guidelines for placing each speaker in a surround sound set up. This article will compare the benefits of speaker stands vs. wall mounts and also some general rules of thumb for speaker placement. 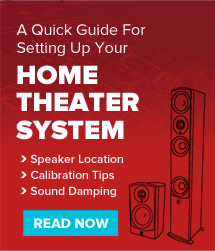 In a home theater setup the most essential speaker is the center channel as 60-70% of the soundtrack and almost all of the dialogue will be directed to this one speaker. So proper placement of this speaker is critical for an enjoyable movie watching experience. Many people will want to sidestep the whole stands vs. mounts question and just place the center channel speaker inside a cabinet. This is fine as long as the speaker is not ported. That’s why here at Aperion, all of our center channels use passive radiators to increase bass response instead of a port. If your center channel is ported and you need to place it in a cabinet, you may need to plug the port in order to keep it from sounding too muddy. If the center is placed in a cabinet, make sure to place it as close to the edge of the cabinet is possible. Any exposed shelving in front of the speaker will cause the sound to bounce off it and create reflections that will negatively affect the sound. The next thing to consider is the speaker’s height off the ground, which you want to be as close to ear level as possible. One thing to note here, the tweeter is the most directional component of the speaker, so it’s most important for this driver to be at ear level. For most people, their ears will be about three feet off the ground when they are in the sitting position of their home theater. The problem is that most center channel stands are only going to get the the tweeter to about two feet off of the ground. That’s because the center channel is a wide speaker and it wouldn’t be stable at any higher height. So for the center channel, if you can’t place it in a cabinet or on any other sort of shelving, a wall mount is the way to go. However if you can only do a stand, try to get one that will angle the speaker, or alternatively, shim the speaker yourself to try and direct the sound upward. The second most important speakers in your setup are your front channels, and for listening to music, they are the most important. Now obviously, if you have tower speakers you can just skip this section as they are designed to just sit on the floor. But for bookshelves the height recommendation is the same as for the center channel, as close to ear level as you can get them. For the smaller footprint of a bookshelf, which also has more height to the speaker, there are many stands that will get the tweeter to roughly ear level. But if you have the option to wall mount at ear level, this is a great solution too. You can even mount slightly above ear level and angle them down without much sacrifice in sound. But once you start getting over six feet or so off the ground, then you will have trouble getting enough angle on the speaker to effectively direct the sound toward your ear. If you have to mount the speakers higher than four feet or so, consider mounting them upside down with the tweeter at the bottom of the speaker to get it closer to your ear. Another caveat, in the case of a larger bookshelf with a good amount of bass, like our Verus Grand, a wall mount will likely put the speaker closer than optimal to the wall. For a larger bookshelf with a six inch driver, a speaker stand will be the ideal choice. Which brings us to the surround speakers. Because the nature of these speakers is to give you more background/ambient sounds they are ideally placed a little higher than ear level to give you a more enveloping and less directional sound. Optimal placement will be about four to six feet off the ground but you can go a bit higher with this speakers up to around seven feet off the ground if needed. If you have a bipole or dipole type speaker, the upper range of six to seven feet up is ideal to give a more diffuse sound. Since around four feet is the lowest you want to place a surround speaker, a wall mount is ideal for these speakers and that goes for both side and rear surrounds. And of course if you have height channels for a Dolby Atmos setup, you’ll want to wall mount those as well. If you absolutely have to place a surround speaker on a stand, go with one that will get the speaker as high as possible. We sell these stands that go up to 42″, so they will get the tweeter pretty close to four feet off the ground, but they are only designed for smaller speakers like our Intimus 4B. Here are some 36 inch stands that will support a larger speaker like the 5B or Verus Grand Bookshelves. One other thing to consider in the pros and cons of stands vs. mounts is that if the speakers are wall mounted, then you’ll be fairly locked in to that placement for a while. So one advantage to stands is they do provide flexibility in terms of changing the room configuration. So keep that in mind if you are the type that likes to rearrange furniture on a regular basis. We hope you’ve enjoyed this comparison of speaker stands and wall mounts, happy listening!